When you think of a seafood restaurant, you likely picture in your mind the Red Lobster aesthetic: weathered wood, dock posts with rope wrapped around them, shiplap siding, and literal interpretations of the seaside like the quintessential life saver motif. Seafood concepts can run a fine line of being contrived and stereotypical, but Plan B was tasked with creating a seafood concept that broke down what you thought a seafood restaurant was and to create a unique setting for any occasion. The phrase used internally to direct some of the design choices was “a light, bright, fun seafood gastropub with a splash of tiki”. There are a lot of elements in that phrase to digest, but when broken down you start to understand how design choices were made to create The Keeper, a fresh take on a classic concept. "signaling seafood in the design was important, but more essential was that it was just a nod and it wasn’t overstated"
First, “light bright, and fun” is used to drive the color scheme, engaging fresh greens, airy blues, and pops of orange and yellow. There is an undertone of midcentury modern details found in the globe lighting and some of the furniture that keeps the vibe fun, casual, and lounge like. 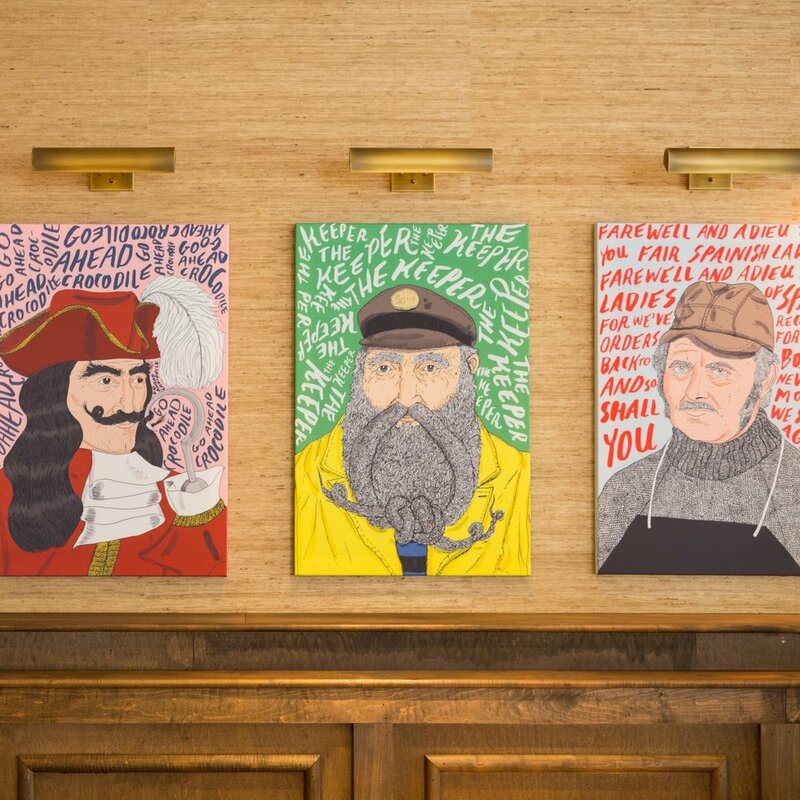 Quirky hand drawn artwork in bright colors throw a punch on a back wall, creating a conversation piece. Second, signaling seafood in the design was important, but more essential was that it was just a nod and it wasn’t overstated. Starting with subtle elements, the fabric patterns were abstractions of coral and fish bones found on the banquette and dining chairs. Another nuance is the use of curves found in the architectural elements and flow of the space. Large built-in planters and waiting seats curve into the space, a curved banquette and circular sociable found in the lounge area continue the seascape-inspired layout, as well as small curves on the bar die wall joining the large bar to the hex tile floor. A custom floor pattern is found at the floor transition between the wood textured floor and the hex tile which is an abstraction of the water’s edge hitting the shore. Another element directing people’s attention to seafood is the large expanse of windows opening into the kitchen directly from the dining room as well as a window looking in on the preparation in the fish cooler. Most likely the strongest point of the seafood concept is the use of brass fixtures and trim found in the nautical caged lighting, mermaid door handles, and conduit running from all the lighting, which calls out a unique part of the brand. The Keeper restaurant is land locked in Texas, but the clients wanted the freshest seafood possible which meant they would coordinate with local fishermen all over the world to ship their catches quickly. To abstract this idea of seafood coming from all different routes to the restaurant, brass conduit is running all around the ceiling and walls of the space connecting to each light fixture. The only time the conduit is terminated is a light fixture over each dining table in the main dining room pointing to the fact that the fish they are enjoying is coming directly to their table. "By pulling elements from different parts of the brand voice, abstracting parts that might be too literal, and subtly nodding to others The Keeper was achieved "
Third, gastropub elements can be found in the black and white one-inch hex tile, dark stained wood wainscot wrapping the dining space, and the transom window architectural detail evoking a historic pub feel. In addition, tufted upholstery, nail head trim, and re-invented pub chairs were used to ground the seating in an old world gastropub atmosphere. Last, the client expressed a desire for tiki bar drinks. While this restaurant was not supposed to be a tiki bar there needed to be some elements in the design that pointed in that direction. Inspiration was pulled from tiki bars from the midcentury modern era and a plethora of vegetation like palms and other tropical looking plants were placed in the space, most notably in a bulkhead planter above patrons enjoying themselves at the bar. Additionally, grass cloth wallcoverings hug each end of the large space softening the edges into a tropical vibe. A point of designing this restaurant was to be a unique, timeless dining experience without being a contrived seafood concept. By pulling elements from different parts of the brand voice, abstracting parts that might be too literal, and subtly nodding to others The Keeper was achieved. As designers it can be a challenge to be fresh, but the magic happens when you mix ideas, pull inspiration when you least expect it, and abstract rather than literalize to make a unique brand.